Energy security is on everyone’s mind but there’s increasing skepticism that ethanol contributes positively toward that goal. Various environmental organizations are voicing strong objections against the generous subsidies the sector is receiving. 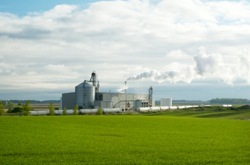 The corn-based ethanol industry received $3 billion in tax credits in 2007, more than four times the $690 million in credits available to companies trying to expand all other forms of renewable energy, including solar, wind and geothermal power,” according to the Environmental Working Group in a statement to the Associated Press. The EWG is one of four environment organizations reiterating their call for an end to ethanol subsidies. The environmentalists say the federal government subsidies are not contributing toward a clean environment by aiding the ethanol industry. Ethanol is made mainly from corn and has a footprint that is almost as catastrophic as that of regular gasoline. The industry creates farm-related pollution and waste, says the EWG. What’s more, it contributes little to energy security, according to the organization. Ethanol received 76% of all federal renewable energy tax credits over 2007 and the federal subsidies rise each year. EWG projects that by 2010, ethanol will cost taxpayers more than $5 billion a year. More than what the US Department of Agriculture contributes to soil protection projects and wildlife habitat put together. Apart from the Environmental Working Group, Friends of Earth, and the Network for New Energy Choices also signed the communal petition calling on the Federal government to cancel the annual ethanol requirement. It should be noted that the ethanol industry already receives more taxpayer-funded support than any other renewable energy program; two out of every three dollars the U.S. government spends on what it classifies as renewable energy programs, including wind, solar, and geothermal, goes to the ethanol industry”, the organizations assert. The groups say that with evidence mounting that biofuels are worsening global warming and harming water quality and wildlife habitat, it makes no sense for the federal government to lavish billions more on an industry already flush with government assistance. Couldn´t agree more! A striking example of the negative effects involved is the case of Iowa, where greenhouse gas emissions from corn ethanol plants equal 1.4 million cars on the road.